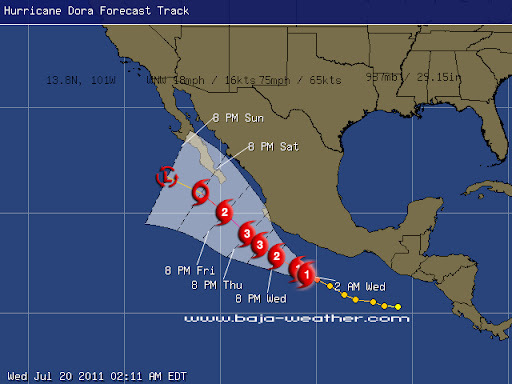 Dora moving quickly toward the west-northwest. 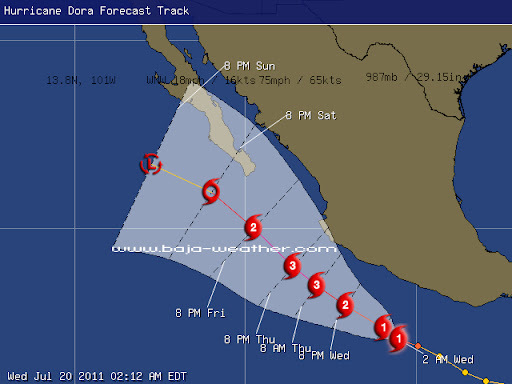 A tropical storm watch is in effect for Lazaro Cardenas to Cabo Corrientes. A tropical storm watch means that tropical storm conditions are possible within the watch area, in this case within 24 to 36 hours. 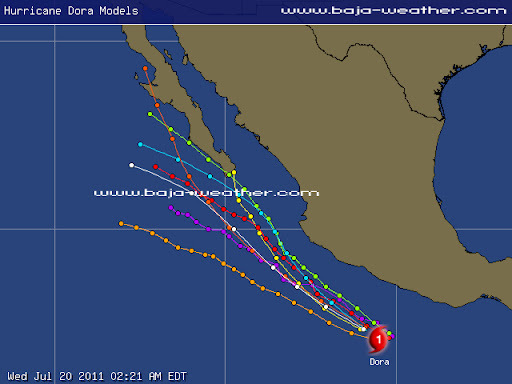 At 0600 UTC the center of Hurricane Dora was located near latitude 13.8 north longitude 101.0 west. Dora is moving toward the west-northwest near 18 mph/30 km/h and this general motion is expected to continue for the next couple of days with some decrease in forward speed. On the forecast track the center of Dora should move nearly parallel to the coast of southwestern Mexico during the next couple of days. Maximum sustained winds are near 75 mph/120 km/h with higher gusts. Dora is a category one hurricane on the Saffir-Simpson hurricane wind scale. Additional strengthening is forecast during the next 48 hours and Dora could become a major hurricane by Thursday. Tropical storm conditions are possible within the eastern portion of the watch area by late Wednesday and within the remainder of the watch area by Thursday. Swells generated by Dora will affect the coast of southern and southwestern Mexico during the next couple of days. These swells are likely to cause life-threatening surf and rip current conditions.